The pilot reported that during landing, about 20ft above ground level and about 80kts, he reached for his iPad. He took his eyes off the runway to grab the device that was located on the seat next to him and the airplane collided with the ground, in a nose down attitude. The pilot reported that he should not have taken his eyes off the runway during landing. The airplane sustained substantial damage to the lower fuselage stringers, longerons, and formers. ROCKFORD (WREX) - UPDATE: The pilot whose plane crashed at the Chicago/Rockford International Airport earlier this morning is in good condition. 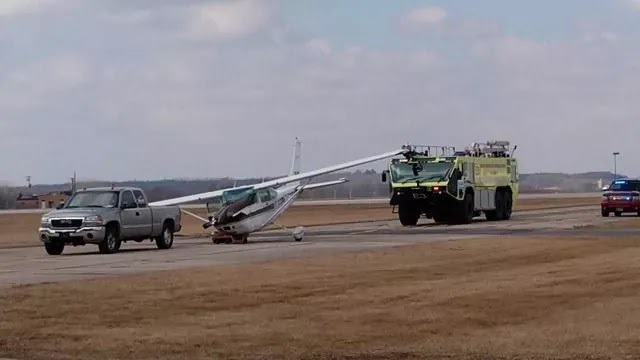 The Rockford airport says that the Cessna 182Q Skylane crashed at about 9:30 this morning. The plane was attempting to land at the airport. Details leading up to the crash are still limited at this time. The pilot is in good condition and was the only one on board at the time of the crash. The Federal Aviation Administration will be investigating the cause of the crash. At this time, the airport is fully operational with no flight delays. A small plane crashes Monday morning at Chicago/Rockford International Airport, according to the Federal Aviation Administration. Details are limited at this time, and it's unclear if the pilot is injured. According to the FAA, a pilot flying from Dubuque, Iowa to Rockford was preparing to land at RFD when the Cessna 182Q Skylane crashed. The FAA says the crash is under investigation, and that the investigation could take several weeks to months before it is completed.